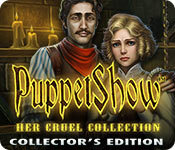 PuppetShow: Her Cruel Collection Collector's Edition is rated 3.4 out of 5 by 30. Rated 5 out of 5 by Chrisppp from Puppet Show is back! I started to say I was surprised at the few (and poor) reviews this game is getting, but perhaps a lot of people aren't bothering with this one because the last couple have been middling to poor (in my opinion). This one is SO much better than the last two! The puzzles are fun and not impossible to do, the HOPs are great, the story line is well done and keeps you interested. The graphics, colors and sound are great. I love the music...I really loved the music in the very first one and this is so much like it. I'm very, very glad I got this one! Please, PuppetShow, more like this! REALLY excellent game! Thank you! Rated 5 out of 5 by skullfun from PuppetShow 9...A Love Story of Marjory and James!!! The PuppetShow series must go on! The series has just gotten a new addition and I loved it! 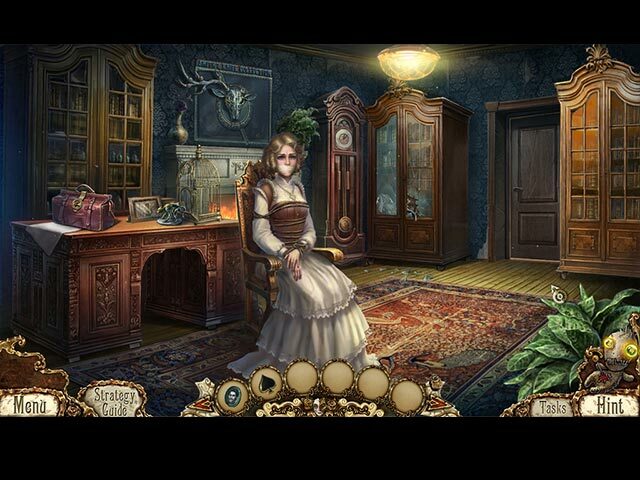 Her Cruel Collection is a hidden object game in which your goal is to investigate a series of kidnappings and catch the ones responsible before others are taken as well. A girl and a boy are in love. She is rich and her father does not approve, he is not so rich, but very ill. Things go all the way south when he disappears and then she disappears. The story puts you in the role of a detective who’s investigating these kidnappings. You get to choose whether to be a male or a female investigator, which makes the experience slightly customizable. Naturally, there’s a big emphasis on puppets and creepy dolls throughout the story, given the fact that you stumble onto them in a variety of weird places. You are called in for an investigation, but things are not so simple because you are surrounded by puppets and not real people who pretend to be what they are not. You get a mechanical helper for this adventure, a cat. There is also a bonus game to add more love tension and info about James' illness to the story. I also love how much detail and sound/SFX ERS put into creating the adventure. The game also comes with a "graphic content" disclaimer which I think is brilliant. Like telling you before a movie "For Mature Audiences Only". You gotta give developers credit for putting a lot of thought into this latest edition especially if you are a long-time fan of this unique series. If you want a unique and "think outside the box" mystery then this game is for you. Hope you enjoy it as much as I did. Purchase CE if you want to know how the story really ends with the included bonus game. Rated 5 out of 5 by biscuitsmama from HELP MARJORY SAVE HER BELOVED JAMES Puppet Show Her Cruel Collection is number ten in the series, unless I missed one somewhere along the line. Fortunately, Her Cruel Collection is far better than the last game and one that I find very interesting and enjoyable. I tend to be a bit squeamish so I am not sure about the game being blood-spattered since I haven’t noticed it or found it objectionable. The storyline is interesting and I am not sure how it is going to end as it is keeping me guessing. We, of course, get to play the game as a detective who has been hired by Marjory to rescue her beloved James from kidnappers who are holding him for ransom. Marjory comes from a wealthy family but dad seems to be a bit of a miser as he refuses to loan Marjory the money for the ransom and, in fact, he places her on the dreaded restriction to keep her from following the kidnappers. Well, we know how long that will last as it isn’t long before Marjory is out searching for James and ending up in a load of trouble. 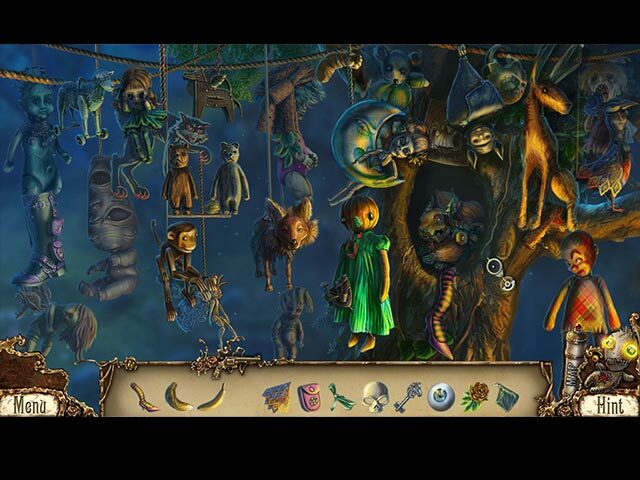 Even though I have always found the Puppet Show games a bit creepy I still love the graphics created by this developer. The hand-drawn graphics, even though a bit dark, create the perfect setting for the game. IMHO, no other developer creates characters as animated and realistic looking as this artistic team. The voice overs are good but Marjory’s high-pitched tone did get to me a bit. Our tools include an interactive map and a pet helper of sorts. Since Marjory is allergic to cats her daddy gifted her with a grotesque mechanical cat. Well since this team seems wedded to a pet helper, I think I would have preferred furry rather than the monstrosity that we have doing rather silly tasks. The cat is probably my least favorite part of the game and, fortunately, he isn’t used that often. The HOPS are far more varied and creative, which is something new for this team. There are still a few list type scenes and even those seem to have some interactive items to find. 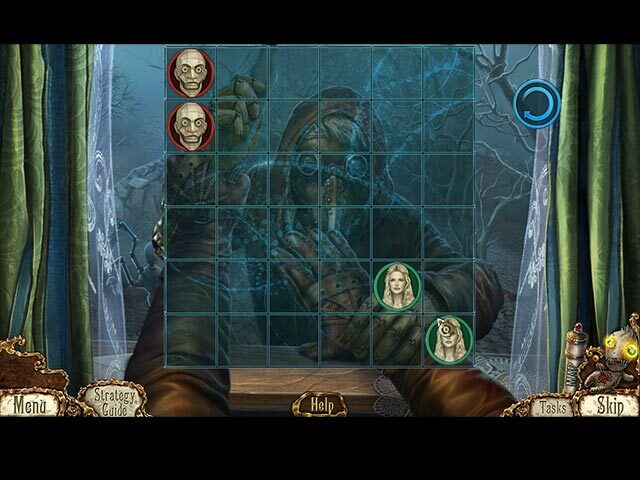 The puzzles are good and include a range of challenge that is sure to please most gamers. Some were easy but there was one early in the game that is the type of puzzle I have never been able to complete in other games and, after fiddling with it for a few minutes, I hit the skip button. The thing about puzzles is that not every gamer is enthusiastic about them or really wants them to be extremely difficult. Some people have an aptitude for solving very challenging puzzles and seem to thrive on them but that isn’t the case for everyone. I love to solve puzzles but I often run into some that are very difficult for me and I don’t always have the patience to fiddle with them too long since I want to move ahead with the story. There isn’t much to say about the CE content of the game because it really doesn’t include anything very spectacular. The in-game strategy guide will prove helpful but most seasoned HOPA players rarely need to use it. Overall, Her Cruel Intention is an excellent game and one of the better ones in the newer Puppet Show games. Yes, it is nothing like the first three or four games that were phenomenal but it is a vast improvement on the last one. The storyline is what captured my interest from the beginning of the game and has held my attention as I have played for the past few hours. I love the entire package of characters, graphics, and sound effects that make Her Cruel Collection a game that I believe many gamers will enjoy. As always, please try the demo to see if this newest Puppet Show is a game you will enjoy. Rated 5 out of 5 by groffjane from PuppetShow: Her Cruel Collection CE I read a couple of reviews. got disappointed. decided to 'try' anyway and I LUV IT. PuppetShow one of my fave series. I play for fun. thank u for this game. I found the gruesomeness up to snuff. and the mechanical cat is really of no concern. just a new gimmick. this game does not disappoint me. Rated 5 out of 5 by gamesrgreatfun from Great Addition to the Puppet Show Series!! I liked the intriguing storyline. Yes, we are saving someone's fiancé again but to me it was interesting. I played over an hour of the demo because I didn't want to stop long enough to buy it! I loved the HOS they were unique! The mini-games were fun. I love the puppets--I own all of the games in this series. I usually wait to review a game until I play the whole thing but with other people giving low reviews I wanted to go ahead and jump in the pond and add my opinion of the game. It's fantastic!! Thanks developers for another fun game for me to play! Rated 5 out of 5 by Daxadillion from Based on the Demo Only. I am not a huge fan of this series and only own about 2-3 of these games but this one grabbed me from the start. You the detective are called upon by a young woman because the love of her life has been kidnapped and she has to pay the ransom before midnight. The graphics are the usual for these devs, although rather dark - well it is approaching midnight! The voices were good and so was the music. At the beginning we get to choose to play as a male or female, and then have a choice of one of three characters. We get a helper in the form of a mechanical cat, so far it has not talked or dressed up in outfits, in fact it just sleeps until you need help. I enjoyed the HOS, some were interactive and others just lists. The Collectibles are statuettes of the characters, I am not sure of how many there are but did count 9 in the achievements section, although there could be more as part of the screen was blocked by clouds. There are 12 Achievements to aim for. I was very pleased to see one about skipping a Mini Game as one of them was one I have never been able to complete. Another achievement is for using the map 10 times. I hope you enjoy it too. Rated 4 out of 5 by Majestyx12 from Love that Mechanical Cat The scenes look so large to me, it's just great. I didn't Love seeing a man chase a woman with a knife though. But I think that was the worse of it. Collect 10 Statuettes. Replay 19 Hops and 17 Mini-games. 15 Movies, 5 Screensavers, 10 Wallpapers, 8 Concept Arts and 4 Music. My Favorite puzzle in the main game was the circus and in the bonus, colored pills and scarab.